With today’s breed of fighters, it is not often that you see a fighter with over 50 professional fights. Toby Imada (30-18) is one of those rare MMA fighters. He has been fighting professionally since 1998 and has fought some of the best the world has to offer. To many Toby came into the spotlight in 2009, as part of the inaugural Bellator tournament. To others Toby came into the spotlight in 2010 when he defeated Andy Souwer (147-14) at the S-Cup in Japan. Toby has excited the Japanese and American fans with his unique grappling and aggressive style. So it is with great pleasure that we got to interview him and we hope you enjoy! CJ: You have been involved in Martial Arts for a long time, can you talk about how you started? What was it like being involved with the sport of MMA before it was mainstream? How has the sport changed the most, in your opinion? TI: It all started with Judo training. That’s where I had encountered wrestlers and jujitsu practitioners. Given my competitive nature, I felt like I needed to cross train and learn their techniques to eliminate whatever advantages they had. My training and success in competition caught the attention of promoters. So when I was invited to compete in NHB matches, I was tentative, but tried it anyway. I never entered MMA to be a fighter. I was always a martial artist with a competitive spirit. Training was a way of life, or a hobby if you prefer. i would attend school, work, and train regularly. and when the opportunity came around I would compete, then go right back to my routine. It was a life style. The sport has evolved to become more than martial arts. It has become something where people prepare otherwise known as “camp”. Money, glamour, fame, even politics have become such a part of it all. CJ: You have fought for a variety of organizations. What is it like being a journeyman/ronin? What are the advantages and disadvantages? Are there any organizations that you have been involved with that stick out in your memory? TI: It feels like everyone hopes for me to lose and the the other guy to win. I kind of feel like I’m not wanted by anyone…hahaha but so what. I dont do this for acceptance. I do it for the previous reason. One advantage to that, which may be the only one, is that I get to go where ever I like. The down side to all that. I must always search for matches. Usually on my own. Bellator will always be memorable. However, to this date, I feel ShootBoxing has been the best to me. Every time I have been scheduled a fight, they have come through with everything they have promised, without having to remind them or fight over anything, and gone beyond. CJ: While you have fought a lot of fights, you are probably most famous for your involvement in 2 tournaments. 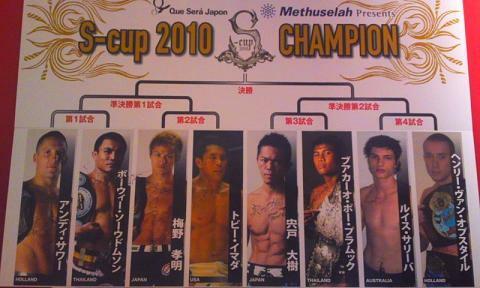 The Bellator Season 1 tournament and the Shoot Boxing S-cup in 2010. Do you prefer fighting in tournaments or doing individual fights? Can you talk about what it is like fighting in a tournament? TI: I like both. Individual fights take pressure away from having to worry about the next match. You also know exactly who you will be facing, given nothing happens and the is a last minute substitution.. I also like the seriousness of tournaments. Having to display a skill level where you can go into and leave a fight taking least amount of damage as possible. There is a greater reward winning several fights as opposed to just one. CJ: Speaking of your participation in the 2010 S-Cup, can you talk about how you got on Shoot Boxing’s radar? Did you pursue them or did they pursue you? What was your initial reaction? TI: Getting into Scup was unintentional, if you can believe that. I had just come off of a fight and before i could get home I had been contacted by a friend asking if i would like to participate. I knew nothing of the organization. They thought I would be perfect for the rules. Apparently SB lost a fighter. Pressed for time and desperately needed to get the slot filled, somehow my name was brought up. I can imagine someone saying, “I bet Toby would take the fight..” I did. Im pleased with my wild decision. CJ: Going into that tournament, you knew that some of the world’s best kick boxers and muay thai fighters were also entering the tournament. Names like Andy Souwer and Buakaw carry a lot of weight. How did it feel going into that tournament? Did you feel like you were representing MMA? TI: Honestly, I hadn’t any idea who these people were or knew hardly anything about hem. Mind you I wasn’t completely sure what the ShootBoxing rules were either. I didn’t know what I was getting myself into. My main focus was to not let anyone walk right through me. CJ: Can you talk about what it was like beating Andy Souwer, the multiple S-Cup Champion, in your first S-cup? What was your strategy? Is it one of the biggest wins of your career? TI: My strategy was to be in his face and take every opportunity possible. Initially I tried to hit him from as any different angles as possible. I was very unorthodox, which may really have played a part in throwing him off. Inside fighting, causing a tie up then reacting with throws. What can I say, but smile. CJ: You stated in a previous interview that your fight with Buakaw was the worst fight you’ve ever been in. Do you think the damage you took from earlier fights affected the fight? Would you be open to a re-match? TI: Previous damage totally played a part in that. I was tired and feeling sore! I don’t know if anyone noticed, but I was already tired in round 3 versus Andy. Buakaw? Oh hell yes I would rematch. CJ: How was the experience as a whole? Is there anything you would like to say about it? Any good stories? CJ: Your tendency to go for throws and submissions mixed with your toughness have made you a fan favorite in Japan. What is that like? How are Japanese fans different from fans in the States? CJ: Going into your fight with Satoru Suzuki, you were coming off of consecutive losses. How did you feel going into that fight, did you feel like you were fighting for your future in Shoot Boxing? During that fight, it seems like Suzuki escaped submissions and throws by collapsing to the canvas. Is this a problem in Shoot Boxing? What was your strategy going into the fight and how did it feel when you won? TI: I was displeased with my previous performances. I got hit with a stomach infection for my fight with Andy which prevented me to recover from the weigh cut adequately. Also, I hadn’t as much time i had hoped for to prepare for such an opponent. It was all a learning process for me. I had to learn how to handle the travel, timing for training, and recovery. I had gathered my previous knowledge to prepare the best I could. Also, stepping up my training regimen. Opponents falling to the ground and grabbing on to the ropes made it a lot more difficult as well as frustrating. So I started working on counters for when they would, and was kind of hoping that they would. Falling to the ground is a problem in SB, but I now have a better understanding of the sport and the rules. SB has modified the rules slightly, to where they have become less tolerant and faster to penalize rope grabbing and falling to the ground in attempt to escape submissions, as seen when Suzuki attempted to fall to the ground when I had applied a standing guillotine. CJ: Can you talk about some of the friendships you have developed over there? Have you ever trained with any of the fighters over there? TI: Seems I have developed a a friendship with several individuals at Caesar Gym as well as a few others. Enough to encourage me further study Japanese language. They’ve been very welcoming. Their mannerism and character has left me spellbound. Unfortunately, I have not yet had the honor to train with any. I hope to someday very soon. I would hold a seminar as a gesture of my gratitude for allowing me to train with them. CJ: Because of your fights with Shoot Boxing, you are known amongst Japanese fighting fans. Have you received any offers to fight for an MMA organization in Japan? Would you like to fight for Pancrase, Shooto, DEEP or even One FC someday? TI: Regrettably, I have not had any offers lately. I would be more than honored to compete in any of those organizations. As any who have witnessed, my style is anything other than boring. CJ: I previously mentioned your participation in Bellator’s 1st season. Can you talk about that? It was during that season that your name became well known, due to your submission of the year over Jorge Masvidal. How did that effect your career? Have you and Bellator gone your separate ways now? TI: At the time, I didn’t think the submission is would cause such a stir. I was excited to have come out victorious. Not sure if the submission is what brought me back or if it were my performances. I am no longer signed with Bellator. Don’t really know what happened there. My management at that time did something and just left me like that. CJ: Can you talk about your future? Do you have any fights lined up? TI: My future, well i am definitely not staying young. Just like anyone else, my time in the sport is very limited. I have relocated and have a new gym. Taking a little time to train and take complete control of myself and training. Not to sound bitter, but things got very unstable for me at my previous location. Now I would be starting from scratch, but this time Ive brought all my knowledge and experience somewhere it can be put to really really good use. CJ: Shoot Boxing has had a couple of events this year, have they contacted you? Would you like to participate in this years S-Cup? TI: I would absolutely participate in every possible SB match. I feel with SB I can act, speak, and display who i am most openly without someone telling me how, when, or what it is they want me to do. The Scup tournament is bi-yearly, so there would be one until next year. My answer, then, would still be ABSOLUTELY, if/when they contact me. CJ: In your opinion, what makes a fighter? TI: In my opinion a fighter is someone with a particular spirit. Someone that can dig deep within them-self despite failure, anguish and struggle, will not give up. Call us stubborn. Determined. CJ: Is there anything that you want to say? To your Japanese fans? To your American Fans? TI: Toby is still in good condition. training, healing, ever improving. Thank you for all the support, cant wait to return and put on a great show for the fans.